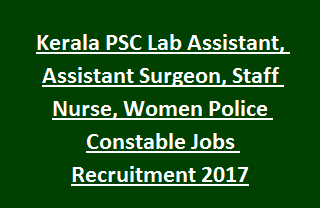 Kerala PSC Lab Assistant, Assistant Surgeon, Staff Nurse, Women Police Constable Jobs Recruitment Notification 2017, Kerala KPSC Women Police Constable, Lab Assistant, Assistant Surgeon, Staff Nurse 126 Govt Jobs Recruitment Exam 2017, Eligibility Criteria for Kerala PSC Women Police Constable, Lab Assistant, Assistant Surgeon, Staff Nurse Govt Vacancies 2017, Kerala PSC Lab Assistant, Assistant Surgeon Recruitment Important dates, Available vacancies in Kerala PSC Lab Assistant, Assistant Surgeon, Women Police Constable Recruitment Application form 2017, Apply online for Kerala PSC Lab Assistant, Assistant Surgeon, Staff Nurse,Women Police Constable Recruitment Exam 2017. Deputy Accounts Manager, Accounts Assistant, Security Guard and other vacancies. There are total 126 vacancies available in Kerala KPSC Recruitment 2017. Interested candidates have to read the eligibility criteria and apply for desired post through www.keralapsc.gov.in. Last date to receive KPSC application through online is 06-December-2017. Candidate applying for Kerala PSC Staff Nurse, Lab Assistant and other Jobs is based on online written test and Interview. Full information regarding Selection Process, Educational Qualifications, Pay scale, Age limit, Application procedure, Exam Syllabus details of Kerala Public Service Commission KPSC Recruitment of Lab Assistant, Assistant Surgeon, Staff Nurse, Women Police Constable Jobs re mentioned below. 1. Deputy Accounts Manager: 02 posts. 2. Farm Superintendent: 01 post. 3. Scheduled Castes Development Officer Grade-II: 04 posts. 5. Junior Instructor (Instrument Mechanic Chemical Plant): 01 post. 6. Laboratory Technician: 01 post. 7. Laboratory Technician Gr II: 01 post. 8. Cath Lab Technician: 03 posts. 9. Technical Superintendent (Engineering): 02 post. 10. Security Guard: 08 posts. 12. Ayurveda Therapist: 03 posts. 13. Lab Assistant: 27 posts. 14. Laboratory Technical Assistant (Agriculture): 02 posts. 16. Assistant Surgeon/ Casualty Medical Officer: 16 posts. 18. Junior Assistant: 03 posts. 19. Clerk Gr I: 04 posts. 23. Reserve Driver: 10 posts. 24. Security Guard: 01 posts. 28. Laboratory Technician Gr II: 02 posts. 29. Junior Health Inspector Gr II: 01 post. 30. Pharmacist Gr II (Ayurveda): 01 post. 31. Pharmacist Gr II (Home): 01 post. 33. Tractor Driver: 01 post. 35. Record Assistant: 01 post. 36. Power Laundry Attender: 03 posts. See the Kerala KPSC Notification for detailed Qualification info for each post. Please check the KPSC official Notification for Age limit & Age relaxation details. Candidates will be offered salary as per Kerala PSC govt norms. Candidates will be shortlisted for Kerala PSC Lab Assistant, Assistant Surgeon, Staff Nurse & other Jobs is based on online written test/ Interview. For Admit Card details, Exam date & syllabus details, please check Kerala KPSC Notification. Eligible candidates having essential criteria may apply for Lab Assistant, Staff Nurse and other vacancies through online using Kerala PSC official website www.keralapsc.gov.in. Application forms can be accepted till 06th December-2017. Apply online for Kerala PSC Lab Assistant, Assistant Surgeon, Staff Nurse,Women Police Constable Recruitment Exam 2017.